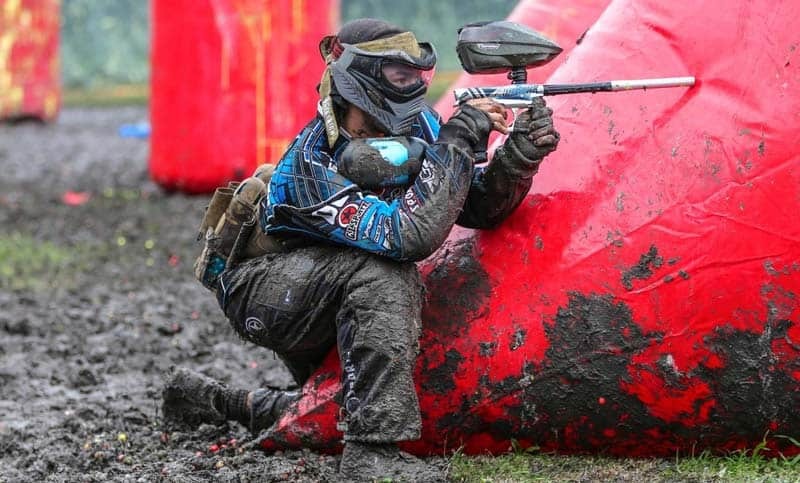 Do you want to bring your paintball hobby to an even higher level? Then why don’t you consider investing in the best paintball mask in the market? 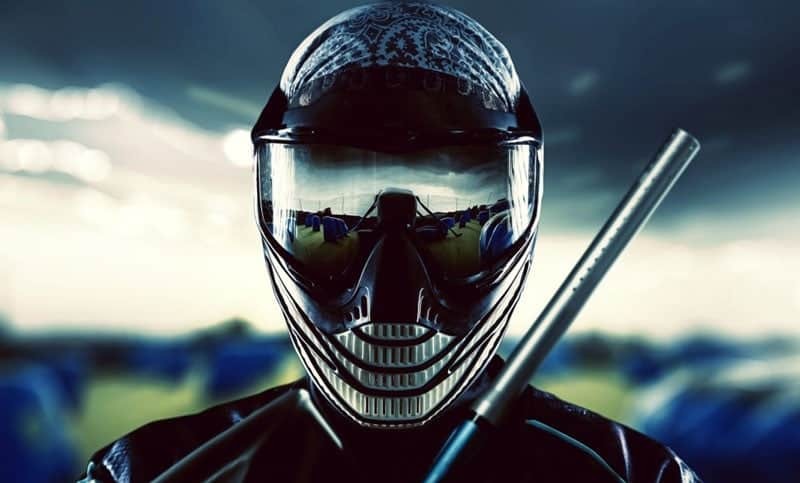 A cool paintball mask can help you feel the game even more. It can also improve your gameplay because it lets you wear some sort of protection for your face. 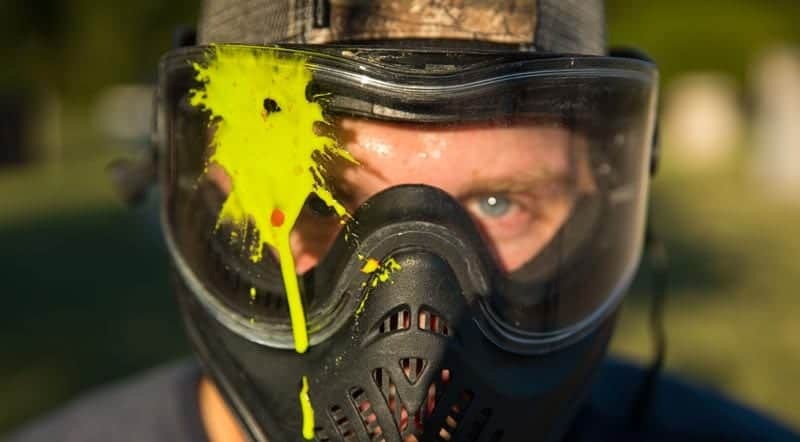 With an awesome paintball mask, you will no longer feel too intimidated, especially if you are still a beginner in the field of paintball and it is still your first time to step into the field. 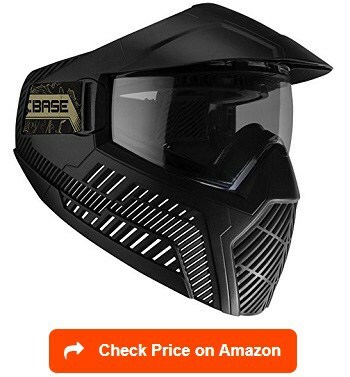 A good mask designed for paintball players is crucial not only in increasing your chances of winning but also in guaranteeing your personal safety. Remember that while paintball is known to be a perfectly safe sport, it is necessary for you to stick to the safety regulations on the field to really ensure that you will not be harmed. It is also necessary to observe the things that are happening around you. A protective gear for paintball, such as the mask, is a vital requirement in all fields. What is good about this gear is that it gives you the opportunity to customize your own paintball mask. 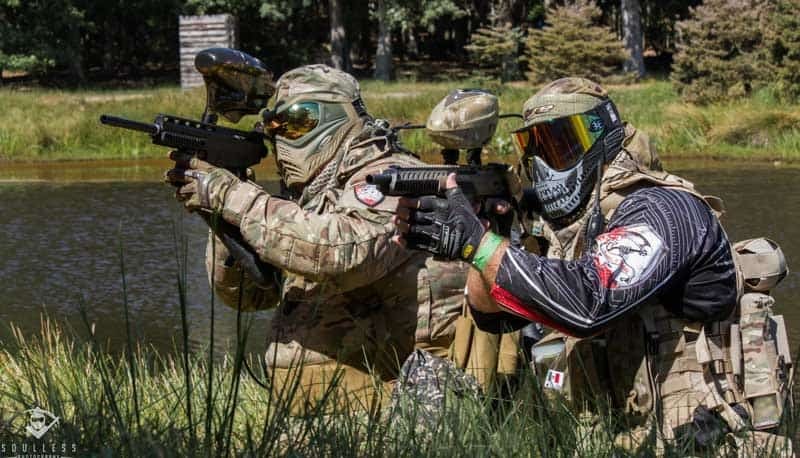 Customizing the look of a player using various tactical gears and accessories is actually one of the things that paintball players look forward to. Fortunately, you can find plenty of well-designed paintball masks from various sources. One of the most impressive paintball masks that I got the chance to encounter is the Dye Precision I4 Thermal. What I am so satisfied with in this paintball mask is its ability to provide full protection to the face. I am also glad that it provides a truly wide peripheral field of vision. Even if you are wearing an eyeglass, you can use this paintball mask, too. If you indeed wear it over your glasses, you have an assurance that its vent layout can maintain its clearness, thereby ensuring that your vision will never be affected. This is also one of those boasting multidirectional paintball mask designs. With such a multidirectional design, communicating with your teammates will be much easier for you. It is because it can carry your voice much further. I am also glad that its foam comes with wide temple cutouts as this means that it can accommodate various thin or thick-armed glasses. Another notable benefit present in this mask is that it is has a high-definition lens, which can fight fogs. It also boasts of its low and close profile while ditching the large sun visor. The result is that putting your face closer to the gun for woodsball or mag-fed games is much easier. However, it is a bit tighter for bigger users or those who have rather large heads so if that is the case for you, then consider trying the mask on first to determine if it can provide enough coverage. Another high-quality paintball mask that I am sure will satisfy the majority of potential users is the DYE i5. 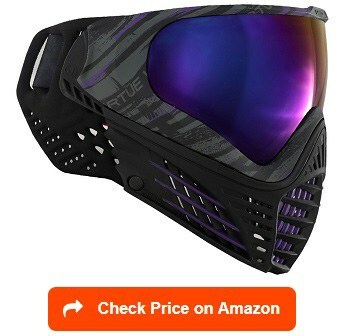 In my opinion, one major highlight of this paintball goggle is its highly advanced dual-pane thermal lens, which is capable of preventing fogging. 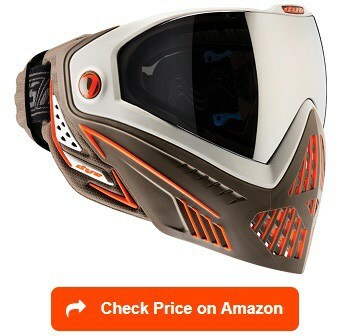 In fact, I can say that it is one of the best paintball masks with an anti-fog feature right now. I am glad that it has a 290-degree field of vision, too. Such provides a fantastic peripheral vision, giving you awesome sights while you are in the field. I am so happy about the comfort level offered by this mask, too. I think it is mainly because of its built-in GSR Pro strap, which is thick but offers a lot of comfort to the user. It even comes with an adjustable dial for your convenience. All it takes to adjust it is to turn it to the right as a means of tightening it and to the left as a means of loosening it, making it more convenient. Another benefit of this paintball goggle comes from its replaceable foam, which features pins that you can push into the mask’s chassis. Aside from being made to be replaceable, the soft-compression foam also provides utmost comfort once it rests on your face. With the built-in Go Pro mount, you do not also need to do some extra tinkering just in case you plan on mounting the camera to show or record your amazing gameplay. However, it is not suitable for use during a full or heavy rain, though, as it is prone to accumulating water within its visor. I am pretty sure that your paintballing experience will become even more fun and exciting if you invest in the Virtue VIO Google, too. One of the things that got my attention is the versatile and innovative design of this mask. The versatility of its design makes it possible for the player to change each aspect of the mask with ease. These include the face mask, itself, and the foam, lens, strap, and ear pads. Another favorite feature of mine is the venting system of this mask. You will notice generous-sized vents at the bottom part of this mask. Such vents are useful in ensuring that hot air stays out. They can also prevent paint from penetrating your face. Furthermore, this mask can give you the sturdiness that is necessary to keep you safe during your game. It is strong and durable as it is constructed out of high-quality hard plastic and foam materials. It can take hits and blows without getting you injured. I am pleased to say that this mask is shock-absorbent, too. The mask is fog-free, which means that there is no need for you to stop often just to clean it up. It boasts of its large lens, which prevents you from dealing with issues when it comes to seeing while you are on the playing field. It has a good field of view and UV protection, too. However, it also has its drawback, such as the fact that it lacks a visor. You might also find the best paintball mask in the form of the Base Paintball Goggle. One impressive quality of this mask is its functional fit. In fact, I am happy to say that it has a contoured profile, which, I think, is really a good thing as it provides full and complete coverage. The strap that comes with it is also adjustable. This means you can adjust it based on what is comfortable enough for you. Such strap is also non-slip plus it can wick moisture, giving you as much comfort as possible. It also provides additional protection to the lens with the aid of its sturdy molded visor. The presence of this visor is also the key to minimizing glare in all kinds of conditions. The overall polymer construction of the paintball mask is also strong and comfy. It even takes pride in its quick-change foam and lens system as well as its woven strap, which also boasts of its silicone coating, which can prevent slips. It also promotes a great clarity of vision. Furthermore, it is mainly because of the wide-angle dual-pane anti-fog thermal lens of this mask, which does not have any distortion. There is also an assurance of the ability of this mask to provide optimal protection to the eyes because of the tool-free, moisture-wicking, and modular foam that is built into it. However, some complained that it tends to squeeze on the ears but it is easy to solve by adding some padding on the area. The JT Spectra Flex 8 Thermal Mask is also another option for those who are truly great fans of paintball. It is mainly designed to offer as much protection to the user. What I find so remarkable about this paintball goggle is its ability to provide a full coverage with a high level of efficiency. What I mean about its ability to provide a full coverage is that it guarantees that your entire face and head receives complete protection, especially once you wear it on the field. Weighing only roughly 1.9 lbs., I am sure that this goggle will never weigh you down in the middle of the game. Another remarkable benefit of this paintball mask is the fact that it has detachable parts. With such detachable parts, users will not have a difficult time maintaining the entire mask. Also, carrying it around is also effortless. One more thing that continues a good impression to the user is the built-in visor, which is also easily removable. I find this paintball mask favorable to use, too because of the fact that it is non-toxic while being easy to clean. With its universal fit, it allows it to fit a wide range of users regardless of their age group. Furthermore, it has an adjustable strap, which you can use to loosen or tighten it based on your comfort level. However, some say that it requires more padding on top of the inner part of the mask. Some say that it needs more padding inside. 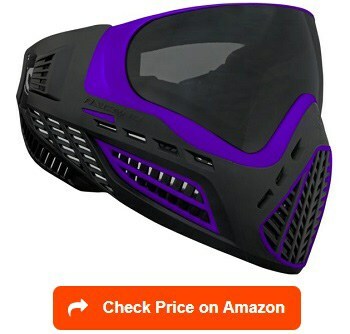 Whether you are looking for a paintball mask designed for speedball, woodsball, or any other version of paintball, I am sure that the Virtue VIO Ascend will give you the satisfaction you are hoping to enjoy. I am so happy to inform potential users that this mask is totally customizable. In fact, you have up to sixteen cool options for the lens if you choose to buy this mask. Some of your options include the light smoke, dark smoke, super bright, chromatic gold, and sporty. You can’t just customize the lens as there are also several designs and colors available for the straps of this mask. In addition, it gives you up to 18 options for its visor. Aside from being customizable, this mask is also awesome because of its breathability. It provides good airflow and ventilation. You can also breathe easily while you are wearing it. Plus you get the chance to let sounds in and out without worrying about distortion or echo. The foam used in this mask is also fully replaceable. This makes the mask long-lasting as you just need to switch or change the lens or foam when necessary or when they experience wear and tear. It is also constructed out of dual materials to guarantee protection, comfort, flexibility, and rigidity. One problem, though, is that it tends to be quite loose for some paintball players. You also have to make it a point to include the Empire E-Flex Paintball Mask in your list of paintball mask options. One thing I appreciate about this mask is its good ventilation. It has plenty of ventilation, which, I am sure can give a high level of comfort and convenience to any user out there. The lens also boasts of its variable thickness, which means that it will never cause any distortion in your field of vision. I also feel that one of the strongest points in this paintball mask is its lightness. It is a lightweight mask, which means that you will not find it burdensome to use once you are in the field. I am happy with the soft and comfy face cover that it uses. It has a reduced profile plus it is well-ventilated. The reduced profile of the mask can help ensure that you can use it to aim down optics or iron sights. It also has a fantastic quick lens swapping system. One more thing that it takes pride in is the dual-layer anti-fog lens with a thermal treatment, making it really effective in handling fogs. One more advantage that I find noticeable in this paintball goggle is its thick and comfortable foam supports. It provides a kind of protection to your ear, which feels great, too. One issue that some of this paintball goggle users encountered, though, is the fact that it has a slightly thickly padded foam in the area surrounding the nose. Some find the foam surrounding the nose too thick. 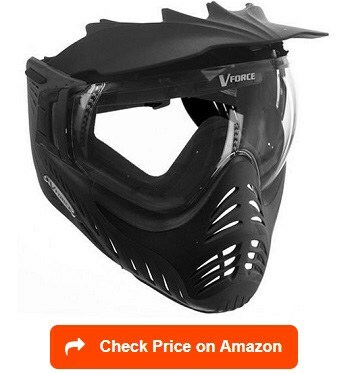 If you are in search of a high-quality thermal paintball mask then I highly suggest including the VForce Profiler in your list of choices. I can assure you that it is capable of delivering a good performance considering the fact that it can enhance your field of vision with its max of 280-degree peripheral vision. I am glad to say that this paintball mask does not disappoint in terms of offering comfort, too. 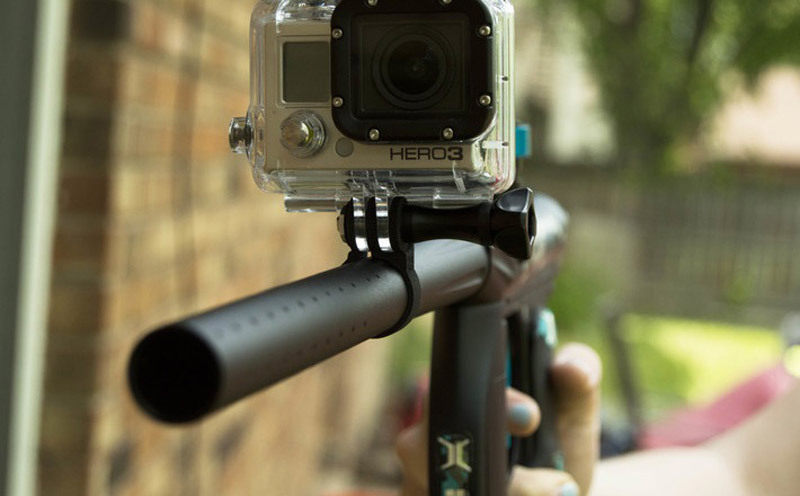 I think it is primarily due to its ultra-lightweight design, which can help ensure that your movements will never be restricted once you start using it in the paintball field. It is also comfortable with the help of its soft and dual-density foam. Such foam is fast-drying, too, which means that it will not be that difficult to use. Another thing that I can say is so favorable in this thermal paintball mask is its head target design. Such promotes a lower profile for the mask, thereby minimizing the target zone. The lower part of this mask is soft and rubbery, making it possible to obtain bounces. It boasts of its solid frame, too, which means that it can handle hits and blows, thereby keeping you safe and fully protected all the time. However, some find the sides of the paintball mask slightly short, which prevents it from covering the jaw completely. The sides are slightly short for some users. 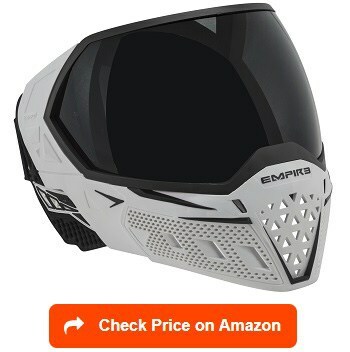 The Empire EVS Paintball Mask is also one of the best paintball masks that I had the opportunity to access in the market. In my opinion, one strong trait of this mask is its roomy interior. With the roomy interior provided by the Empire EVS, I can say that it has the ability to accommodate all sizes and shapes of eyeglasses. I am satisfied with the built-in spherical and dual-pane lens of this mask, too, as it works in dominating and beating fog. It is mainly because such leans can develop a thermal barrier. It does so without causing any distortion in your vision, thereby maximizing your accuracy. I am also glad to say that the lower skirt of this paintball mask is highly flexible. With such flexibility, I find it effective in stimulating ball bounces. It provides a good amount of ventilation, too. This is actually a good thing if you want to communicate clearly with your team members while suppressing echoes. Another thing that is beneficial in this paintball mask is the fact that it comes with a clear lens. With that, you have an option of buying another color without worrying about dealing with difficulty when swapping or changing the lens. In fact, you can swap it without the use of any tool. However, be aware that the facial foam is triple-layered, which makes it slightly stiff during your first uses. You can break it in after several uses, though, making it more comfortable as time goes by. Lastly, there is the V-Force Grill Thermal Paintball Google. 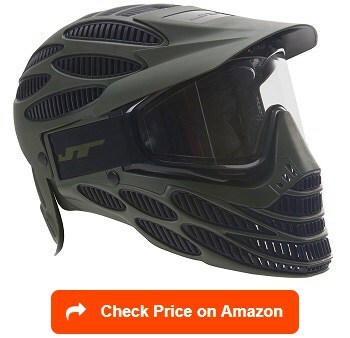 I noticed that it has an aggressive look, which is actually a good thing if you want to look cool on the paintball field. It has crisp clean lines that accent its low-profile design. It is also lightweight. The combination of its lightweight and low-profile design makes it truly ideal for speedball players. I am so glad that this paintball goggle has parts that are easily replaceable. This means that I can customize it based on my preference. In fact, there are several cool colors available for the visor, promoting a quick customization. I find it super comfortable, too – thanks to its built-in foam. One more advantage of this paintball goggle is the fact that you can easily breathe while wearing it. You can even communicate with your teammates well even with the mask on. Even with the fact that it is made to be easy to breathe into, it still does not disappoint in terms of offering a full protection to your face. I am sure that you will like its decent design as well as its anti-fog lens with a thermal treatment, too, as it works in boosting its overall performance. One issue, though, is that it does not work as a full paintball helmet, so it would be best to wear a bandanna as a means of protecting your hair and forehead. Your goal when searching for a good and reliable paintball mask is to ensure that you are getting one that can offer you utmost comfort. You need a mask, which comfortably sits and fits well on your face. It should not also move around too much. Note that a mask, which constantly moves, might trigger discomfort on the field. It might even ruin your gameplay and performance. Also, take note that one whole session of paintball can mean spending time on the field for the entire day or for several hours. Of course, you would not want to wear an uncomfortable mask that you have to adjust constantly. If you are after comfort then ensure that your chosen paintball mask comes with a strap system, which you can easily adjust. It should also have some soft foam padding as it will heighten the level of comfort it offers. Note, however, that some low-quality masks also make use of low-quality foam pads that are itchy and rough. With that in mind, you really have to assess the quality of the foam padding included in the mask. Ensure that it is soft and does not cause any itchiness and roughness. Also, note that regardless of whether you pick a minimalist design covering your face and eyes or choose a full-on helmet, your comfort should be on top of your priority. Keep on reminding yourself that you will need to wear it for a long period, so it has to be as comfortable as possible. Also, it needs to provide a good level of ventilation. That way, you can stay comfortable and cool inside. In the paintball game, your vision is extremely important. Note that having a compromised vision while you are on the field might cause you to be out of the game right away. With that in mind, it is really critical for you to assess the lens of the paintball mask prior to buying. Your goal is to find a paintball mask with a lens that can provide you with a field of vision, which is up to 260 to 270 degrees wide. As much as possible, stay away from cheap rentals as the ones offered here can only limit or restrict your peripheral vision. It is mainly because of the narrow and flat lens used in the mask. What you should be after are high-grade lenses that are not only spherical but also work without any distortion. The lens should let you see things from the corner of your eye, particularly in a close quarter. Also, remember that while on the field, there is a higher risk for you to sweat out. The problem with this is that it might fog the lens unless it has a thermal treatment applied. Also, for safety purposes, you will not be allowed to remove your mask. In this case, you need the best anti-fog paintball mask, which is attainable by ensuring that the lens has an anti-fog treatment. Make sure that the lens also sits at a slight distance away from your face. 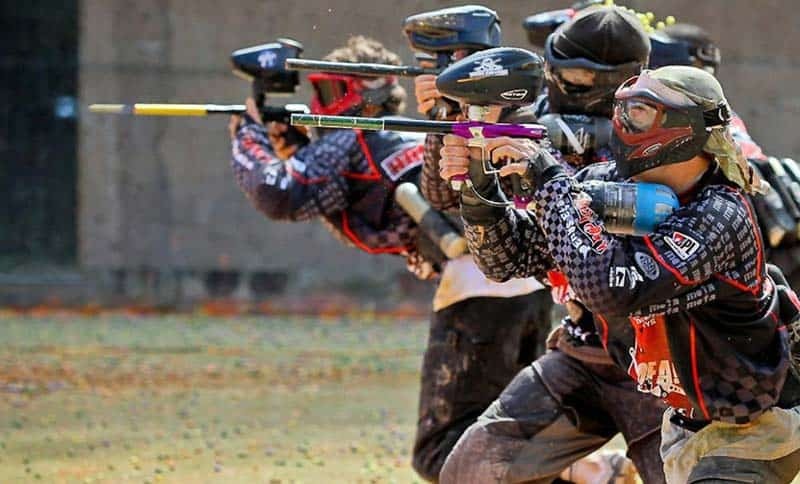 Such quality can make up the best paintball mask for glasses, as it gives you the opportunity of wearing glasses beneath it while ensuring that your body heat is away. Ensure that the distance is not too much, though, as it might only hinder you while making the mask bulky. The goal here is to achieve a middle ground in terms of its distance to your face. Aside from picking any of the paintball masks that don’t fog, it also helps to have a lens with an anti-scratch coating. It is because this coating can lengthen the functional lifespan of the lens. In addition, interchangeable lenses are beneficial, especially if you are planning to replace an already broken one or just wish to make a custom mask that comes with newer optics. It helps to look for a mask with mirrored, colored, or chromatic lens, too. It is because such lens can prevent glare while also serving its purpose when used during sunny conditions. Moreover, it helps to have a forehead visor as it also offers protection from various weather conditions and from hits. 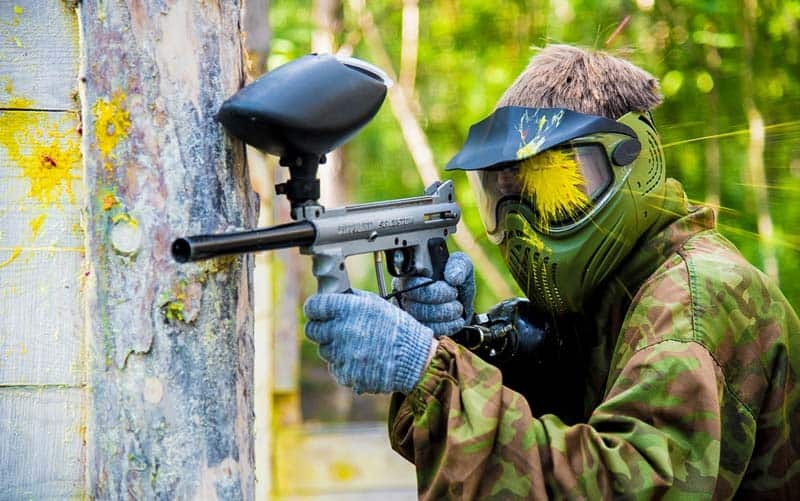 The next thing that you have to pay attention to when searching for a reliable paintball mask is its durability. While making your paintball mask last is possible by ensuring that you do not abuse it too much, it is still necessary to look for one constructed out of a truly durable material. 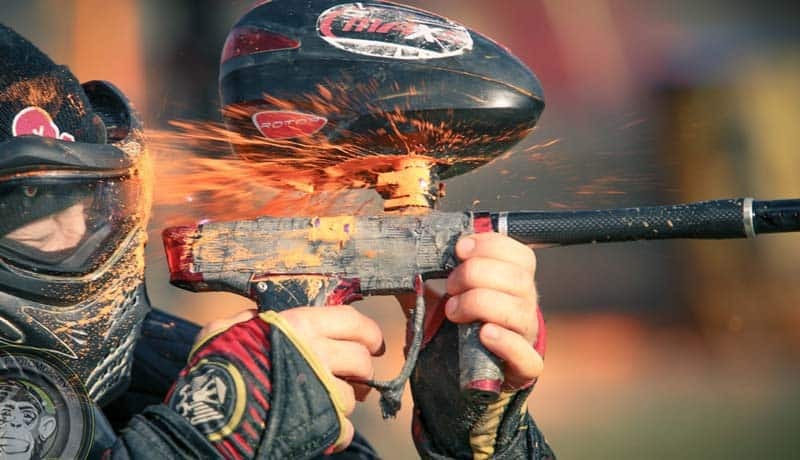 All the materials that make up your paintball mask should be tough enough in the sense that they can handle the wear and tear and withstand abuse and other rough situations. Also, note that while hard plastics are considered by many as resistant and sturdy when used on the mask, these can also result in stiffness without paintball bounces. If possible, go for high-grade masks constructed from genuinely durable materials. Go for one made of durable yet soft and flexible material. Also, remember that high-grade masks often come with a facial area and skirt, which is constructed from a sturdy, soft and flexible material. This is a good thing if you want it to withstand all possible abuse. Another thing that you have to keep in mind regarding the mask’s durability is the fact that a dual-pane lens is usually sturdier in comparison to one with just a single pane. You will need to assess the weight of the paintball mask, too. Remember that you will be needing a lightweight one so it will never compromise your performance and gameplay on the field. A mask, which is extremely heavy for your head to carry is burdensome once you start to play in the field. What you have to do, therefore, is to look for a mask, which weighs only around 1-2 lbs. This is lightweight enough in the sense that it will never weigh you down once you are on the field and try to beat your opponents. Another important factor that you have to check out before buying a paintball mask is the level of ear protection it offers. Note that when a wet paintball hits your ears, it can cause some pain while being harmful to your health. With that in mind, it helps to look for a paintball mask that covers your ears completely. You can even find paintball masks that feature padded ear protection. Such feature works in absorbing shocks, thereby ensuring that your ears stay safe. Aside from making the mask more comfortable, the padded ears can also protect you. 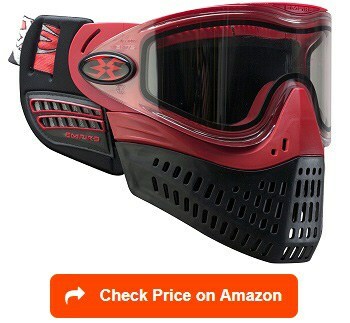 Another important consideration in your search for a reliable paintball mask is its airflow. What you have to choose is that, which has some sort of venting in front. Such vent is crucial in ensuring that you can breathe easy. In addition, it helps you communicate more effectively with the members of your team. One more thing that the vents can do is that they decrease the amount of trapped hot air within your paintball mask. With that, you can expect to stay cool while you are on the battlefield. UV protection is also a vital element and component in your paintball mask. Note that as a paintball player, there is a great possibility that you will be out all day playing the game and getting exposed to the sun. The problem with this is that it can also seriously harm your eyes. With that in mind, it is necessary to find a paintball mask capable of providing the right level of UV protection. It should never fail to give sun protection to your eyes. This can help ensure that your hobby will not damage your eyesight and vision. Does the paintball mask come with the lens? Yes. In most cases, the paintball mask offered by manufacturers already comes with their own lens. In fact, it serves as the most vital part of your paintball mask. It is mainly because the lens is the one, which lets you see through the entire game. In addition, it is what protects your eyes while you are on the field. However, take note that it is also possible for you to replace the lens that already comes along with the paintball mask you chose to buy. You can change it just in case it gets damaged. You also have the option of replacing the built-in lens in your mask if you feel like you need one which offers more protection. Does it come with a chin strap? Most of the paintball masks in the market today are already equipped with a chin strap. Some of these straps are detachable. While wearing the chin strap is often a preference, take note that there are certain tournament leagues and fields that require you to wear the chin strap that come along with your mask when you are playing. What’s good about the built-in chin strap is that it prevents your mask from falling off in the middle of the game, especially if you do some intense movements, like rolling away. It is a vital feature in a paintball mask so be sure that it is present when you are buying one. How well can you breathe in the paintball mask? It depends on the amount of airflow that your chosen paintball mask provides. With that in mind, you need a mask with the right number of vents as such can help you breathe well while you are wearing it. Ensure that the mask does not only supply air from its bottom part. In this case, the vents in the mask should surround the cheek and mouth areas to ensure that you will not have a hard time breathing. With the right number of vents in the mask, you can also minimize the risk of fogging, especially the one caused by breathing heavily. It is because the air tends to move out of the mask’s vents, instead of going up to the lens. Can you wear a paintball mask with glasses? How does it fit? Yes, it is possible for you to wear a paintball mask even if you are wearing glasses. You just have to make sure that your chosen paintball mask is one, which is mainly designed for those with glasses, like you. 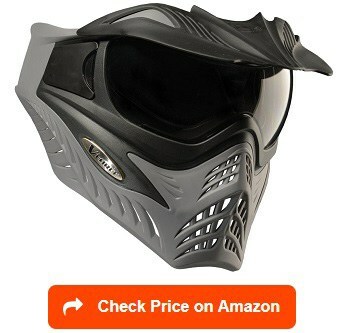 In this case, you have an assurance that the paintball mask will fit even with your glasses on if it comes with a foam, which is cut on both sides of the arms of your glasses. This specific form of mask design can provide your glasses with a range of motion. You can also prevent your glasses from getting squeezed beneath your head. Also, ensure that the mask will ensure that there will be no fog in the glasses. It should be able to minimize the risk of fogging inside your glasses once you put it on. What’s the difference between the anti-fog lens and the thermal lens? In most cases, the anti-fog lens is just a basic way to protect your mask from building up fog. Most of these lenses also come with just a single solid product. The thermal lens, on the other hand, is much more extensive. It is mainly because it is usually constructed out of two independent/separate lenses fused together. They tend to surround the edge of the paintball mask and features a small layer or pocket of air in between them. It is often called the dual-pane lens, with the inner and outer lens having their individual attributes. The outer lens, for instance, is thicker and bigger and tends to offer similar protective properties as the single-pane. The inner lens, on the other hand, is lighter and thinner. It serves as the inner pane of the mask’s dual-pane design, making it even more protective. What are paintball masks made of? A paintball mask can actually be made of various materials. In most cases, though, the exterior part of the mask’s thermal lenses is constructed out of polycarbonate material, which is known for its excellent ability to resist impact. The softness of the polycarbonate material is one of the reasons why the lens also uses an anti-scratch coating. Also, take note that costlier paintball masks are usually smaller and more comfortable. They also usually come with interchangeable parts. Furthermore, they are often constructed out of soft materials to ensure that they get some bounces. Which one is better between Virtue Vio and Dye i4? The choice of a mask is actually a personal and individualized thing so the choice between Virtue Vio and Dye i4 is also left on the discretion of the user. A wise tip is to try both so you can figure out which fits you perfectly. The good news is that both masks are known for their good quality. The two are also highly breathable and feature a good lens. It would be best to fit the two so you can determine which one of them suits your face well and gives you the comfort you need on the field. When a paintball mask fogs up, it is tempting for a player to remove it so they can see clearly and breathe with ease. It is an act that you have to avoid as much as possible, though, as it exposes you to the danger of getting hit right on the face. In this case, it helps to learn a thing or two about how you can stop your paintball mask from fogging. One way to do prevent fog is to use a paintball mask anti-fog spray. The good thing about this spray is that it works in preventing moisture from getting condensed on a flat surface. The main goal here is to spray some mist of this product into your lens. 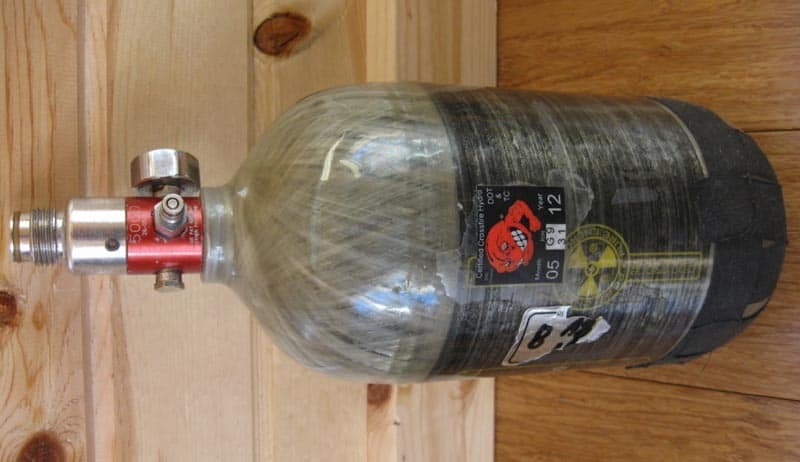 This will prevent the vapor from gathering on your mask and causing it to fog up. You can also use a thermal lens paintball mask. The thermal lens is usually composed of two lenses. In between these two lenses is a thin space filled with air, which serves as a barrier in between the outer temperature and your face. Such protective barrier can help ensure that the inner lens is close to your facial temperature. The result is a limited rate of moisture, which condensates on the lens. In most cases, the thermal lens comes together with all basic masks. You can also add it up as an optional upgrade. It is one of the most effective ways when it comes to reducing fog. Keeping your paintball mask clean is crucial in ensuring that it continues to function at its best. 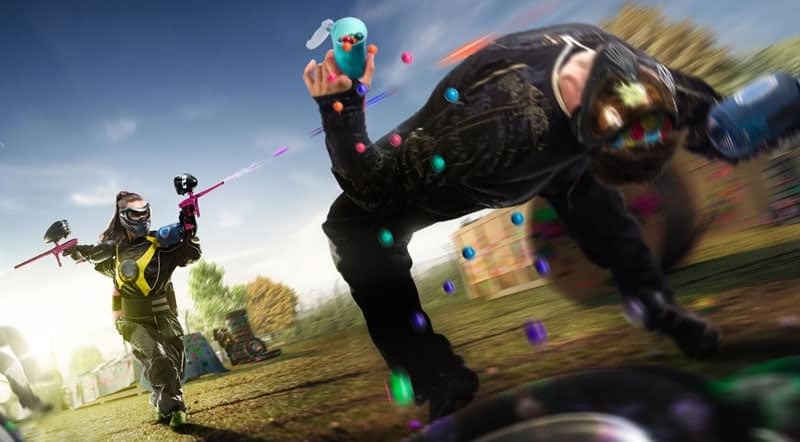 With a clean paintball mask, you can improve your in-game performance, increase the level of your safety, and ensure that it will serve you for quite a long time. One way to keep it clean is to use your palm or a microfiber cloth in wiping off the paint that it accumulates. Make one or two passes through the lens as a means of removing any excess paint. You also have to clean the lens. What you have to do is to spray some squirts of a lens cleaner spray into the area then wipe it off using a microfiber cloth. After cleaning the lens, spend time examining it for damage. Your goal for the assessment is to figure out whether you can still safely use it. If there are cracks or fractures in the lens then it is high time to discard it and look for a replacement. Can I use a paintball mask for airsoft? Yes, you are actually allowed to use your paintball mask for airsoft. The good thing about the paintball mask is that its lens or goggle part is often constructed out of a strong material. The mask also tends to hold the lens securely, making it perfect to use when it comes to airsoft. 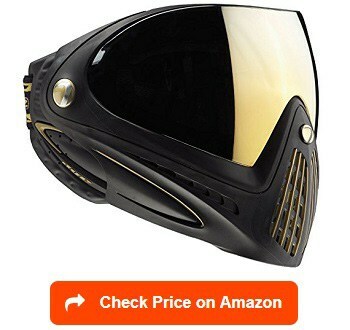 The best paintball mask is definitely a good investment for anyone who is interested in paintball. If you are one of them then make it a point to choose the right mask for you based on the information indicated in this article. The knowledge you gained here will definitely help you find the best out of the many paintball masks out there. 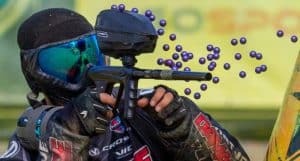 Learn more about how to choose the best paintball guns, under 200, under 300 and best paintballs 2019 with in depth reviews and buyer’s guide. By the way, please have a look at our best paintball hoppers, best paintball tanks and best paintball barrels to improve your paintball game!